Everything Is Art: school holidays are coming up. join a class! During the school holidays, we teach a holiday program. These classes follow the same lesson plans as our weekly classes, but instead of having one class each week, you attend four consecutive classes. 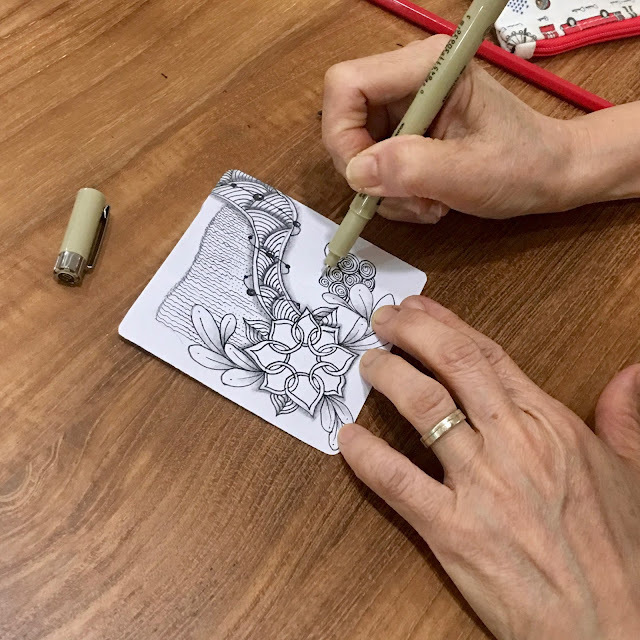 This program is great for adults and children who want to learn about the Zentangle method but do not have time outside of the school holidays to attend extra-curricular activities. Teacher Joni will be teaching a holiday program at Changi-Simei Community Club from the 21st to 24th November 2017 (Tuesday to Friday). From 10am to 11:30am each day. As for me; I'll be teaching a Course Xpress class at Aljunied Community Centre on the 23rd of November 2017 (Thursday). 2:30pm to 3:30pm. Course Xpress classes are like trial classes. However, they are only held during off-peak periods (Mondays to Fridays, between 9am to 5pm). These classes are aimed towards home-makers, students, and senior citizens. The classes are one-time off and only last for one hour. Materials will be provided for by the teachers, but you will only be allowed to bring your art work home. These classes are a great way to try out Zentangle, to see whether you'd want to take part in regular weekly classes. Each class is an affordable $10 for non-PAssion card holders; $9 for PAssion card holders; and $3 for senior citizens. We'll be using Tombow dual brush markers, and you will learn so many different techniques on how to use them... Misting, colour blending, how to create gradients... And best of all, you'll learn how to draw gorgeous gemstones! Ahhh~ It's going to be so much fun!